I wish I'd bought this a year ago. I apologize for my absence. The minute I started thinking of this as my storytelling space, I was in deep trouble. Instead of the Blogger template into which I've been merrily typing for years while drinking coffee on the sofa, the blog became a platform for storytelling, like I think I'm Ira Glass or Jonathan Ames or something. It froze me right up. I wrote some blog posts. They weren't good enough. Every day it got a little harder. This morning I was lying in the dark in bed thinking, how am I ever going to post on the blog again? Type type type, press publish, go buy yourself a frozen custard. That's how. That's the plan, anyway. Have you read this excellent piece by Sarah Miller about why she decided to stop cooking? In the growing body of cooking backlash literature (see this and this), it’s the smartest thing I’ve read, mordant and full of truth, though not quite as much truth as I thought on first reading. Miller has such a crisp and decisive voice that it took me a few days to disentangle her truths from my own. I’ll limit myself to this pretty big difference: I do plenty of stupid things trying to get people to notice and love me, but cooking isn’t one of them. I also liked this essay by Miller and have found myself thinking about it hourly. Here’s a little anecdote. Not a story. Definitely not a story. Last week I made banana blondies with brazil nut toffee from Dan Lepard’s Short and Sweet, a gem of a cookbook. I’ve made these blondies a bunch of times before and they are, in my view, outstanding -- sticky, golden, a little crunchy, perfumed with banana. As with about half the things I bake, no one in the household touched them but me. There was even some jesting about Mom's banana blondies. I expected this. I'm used to it. On Saturday, Owen spent the day at his friend Max’s house. On Saturday night, Max’s father dropped Owen off while Mark and I were out. Max’s father doesn’t like to drive up our street, which is extremely narrow and steep, so he leaves Owen at the bottom of the hill. This is totally fine with me. I mention it only because no one in his right mind would choose to walk up our hill without a really good reason. I couldn't care less what Max thinks of me and I don't want him to love me, but it's gratifying when someone actually eats the stuff you bake. I was so pleased! I told Owen how pleased I was and he quickly tried to paint Max as selfish, greedy, and rude, referring to his behavior with indignation as "making raids on our cookie tins." Does he think I care? The idea that Max might one day walk up the hill and find the cookie tins empty is now unthinkable. Blogger ate my erudite comment and I could weep. Half the world wants to preach the wonders of home cooking and the other half want you to feel badly for enjoying it. I think a lot of the latter comes from women particularly who did it despite not enjoying it, and they need to justify their choices and elucidate the rest of us and to tell us it's ok not to enjoy it (and thus join them in choosing not to do it). I cook because I love to eat delicious things and I can't afford to pay someone to make me delicious things on the regular. I also love it when I impress people with my cooking. And I don't feel even the tiniest bit bad about it. Stupid Blogger. The comment you wrote is erudite enough. So much irrelevant judgment around cooking -- on both "sides." (Sides?!) My mother hated to cook and once she broke free of it she was so much more herself, so much happier. Costco lasagna all the way, baby! But she loved coming over to my house for dinner and I've never cooked for anyone more grateful, enthusiastic, and respectful. I do like to cook - and that doesn't make me a needy, sanctimonious twit who never reads the newspaper. Ugh, it ate mine too! I cook for myself but burst with pride when others love it. Thanks for all the great links. I know! I was hesitating to write about how happy I was that Max liked my cookies because that might betray neediness, but it's not neediness. Just pleasure in giving pleasure. Oh, Jennifer, but you _do_ tell stories in every post! It amazes me that you have placed this pressure on yourself after having written so many posts so beloved by many people. I am going to go out on a limb here and tell you that I think Sarah Miller's writing is very self-involved and neurotic, or perhaps that is just her niche. But I did not find her essays enjoyable. All that self-induced angst! Most of us have plenty, so why would we seek more from an outside source? I don't cook to impress anyone, including myself. I cook for many reasons, among them economy, eating a reasonably balanced diet, knowing what's in my food, increasing my enjoyment of food because I know how I like it, the love of competence in taking care of my own needs,etc. I abhor the notion of doing anything solely to make others love me or give me attention. It is a doomed mission of unreasonable expectations that almost always leads to disappointment. As Katherine Hepburn said, "if you always do what interests you, one person is pleased". It's wonderful when someone enjoys my cooking; we all want to be appreciated. But it is a perk, not a reason to cook. And my failures in the kitchen have never doomed a relationship worth having. I love your posts, even when they are about everyday, mundane things. Your gift is that you can make anything worth reading, so don't over think it. You are a great writer. I was going to leave a comment but beckster has said it all, already, much more articulately than I could. So I'll just go all internet on you and say: ^this. Thanks. You are all so nice. You know the reason why I cook? Because it (usually) tastes better than what I can buy. If it didn't, I wouldn't have a problem with not cooking. That's what I thought the whole time I was reading the Virginia Heffernan story in the Times -- I don't like frozen food and Clif bars. Not snobby. Just don't like. The olives and cheese in Sarah Miller's story? Now that I might be able to work with. He came over yesterday and I told him to eat all the cookies he wanted. Great post, so much to think about. - I have never cooked with the goal of gaining attention or praise either. But I can certainly see that that attitude is likely to lead to disappointment, frustration, and resentment. - The cooking backlash is really nothing new, although there seems to be a spate of writing about it lately. Even in days of yore when there were servants to do the actual cooking, the female head of household was still reponsible for planning the menu, supervising the preparations, and doing everything necessary to make sure three meals got on the table every day; many women found this responsibility onerous and tiresome. There is definitely a difference between cooking because you want to, and cooking because it is assumed to be your responsibility to provide the daily food. Some people do enjoy providing meals for their families every day, and find it fulfilling and gratifying. More often though, it's just another chore, and one that is made more difficult by complainers and picky eaters. - This strikes me as a first-world problem, or a modern problem. In places or times where there was a limited variety of food available, and often not enough food, preparing it was much easier (no mental effort to decide what to make based on nutrition, carbon footprint, and eater's preferences), and complaints were probably rare because people were glad just to have something to eat. - I'm not surprised to see these anti-cooking articles and posts, because there is a lot of bossy popular literature about the crucial role of the family dinner, prepared of course according to each author's specific ideas. At the same time the news is full of information about which foods are bad and which are good, and what is good one week is likely to be deemed bad the next. It's not surprising that people want to give up, feeling that since they'll never get it right anyway, why try? - It's always nice to be appreciated. I'm always baffled that your family doesn't eat your baked goods. I'd certainly take advantage of Max. I love a good audience for my baking, mainly so I can keep trying new things. The faster they are eaten, the sooner I can bake something else. All your points are interesting and I agree. 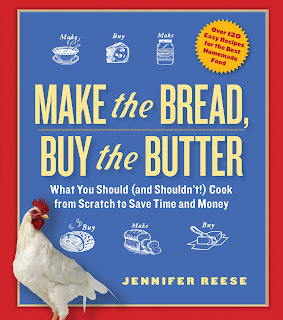 This line is very relevant to my life: "I love a good audience for my baking, mainly so I can keep trying new things. The faster they are eaten, the sooner I can bake something else." I was looking forward to having a teenaged son so he'd eat through all my baking and I could bake and bake and bake, but he prefers cold cereal to almost anything. Dessert? No, he'll just have some cereal. I so look forward to your new posts; also, I look forward to the comments. You have the most interesting, thoughtful comments! I have to be in the mood to cook .. thank God I'm not obligated to cook everyday. When I do make something special, I get great satisfaction out of watching someone eating/enjoying that food. (Is there a word for this?) My daughter thinks I'm sick in the head! BUT I've seen chefs looking out into the restaurant watching people enjoying what they've prepared. It's great when someone likes what you cook! It doesn't mean you feel deflated when they don't. IMO the cooking backlash is largely a reaction to, as Sobaka said above, bossy popular literature. I remember Michael Pollan had a certain narrative a while back that he kept writing about over and over again, about how his mom used to cook every night and how sad it is that nobody does that anymore. And time and time again he would basically blame this degeneration of the family meal on second-wave feminism. So for me the push toward re-embracing the family meal seems inextricably linked with gendered domestic labor. Like, we can all pretend that our world is already perfect, but the majority of the time when you call on people to better feed their families it's gonna be women who feel responsible for that. Where is they rallying cry for men to cook more? It's usually just an afterthought so the author can say they're not telling women to get back into the kitchen. So while I think a lot of people empathized with Sarah Miller's piece since it focused on personal feelings of guilt and inadequacy, Virginia Heffernan's NY Times article got a lot of criticism for rightly calling out the home cooking warriors for not addressing the cultural aspect. Michael Ruhlman even called her "shrill," which is just...no. I am totally going to make those blondies! I am an unabashed blondie lover, and I can't imagine a world in which people do not want to eat them. So hooray for Max! Absolutely right, the backlash was inevitable. People are way too sanctimonious about cooking. Did Ruhlman call Heffernan shrill? I didn't see that. Talk about a sexist adjective! Shrill isn't the word I would have chosen. I have never eaten a blondie (we call them blond brownies here) that I liked, ever. John's mother has a cookie tin, although it is a tupperware container, and it is usually full of sublime molasses cookies, but more and more lately it is full of blondies. HORRORS. Once I said to John, "I want you to put on my tombstone 'She Hated Blond Brownies.'" But I tell him stuff to put on my tombstone all the time, including "She Hated the Chick-fil-A Cows So Much" so I'm not sure what will end up there. I love to eat good food, so I cook. Most of the time I don't mind it, but when I'm not in the mood, I don't do it, and a rotisserie chicken from Costco is a perfectly acceptable substitute. People shouldn't be bullied into cooking if they hate it, and I agree that the call to cook for oneself and one's family should be sounded to men and women in equal measure. Exactly. You are right about everything except blonde brownies. My treadmill is jealous, as he can only precariously hold an iPad. Is it difficult to read while walking? When I am a passenger in a car, I find that I am unable to read because the bumps and jolts make me lose my place and go all queasy. I would think that I would have a similar problem on the deskmill. The teapot cracks me up! May I borrow Max for a few days? We've had a string of failures (the Huckleberry cookbook) and I could use a cheerleader! 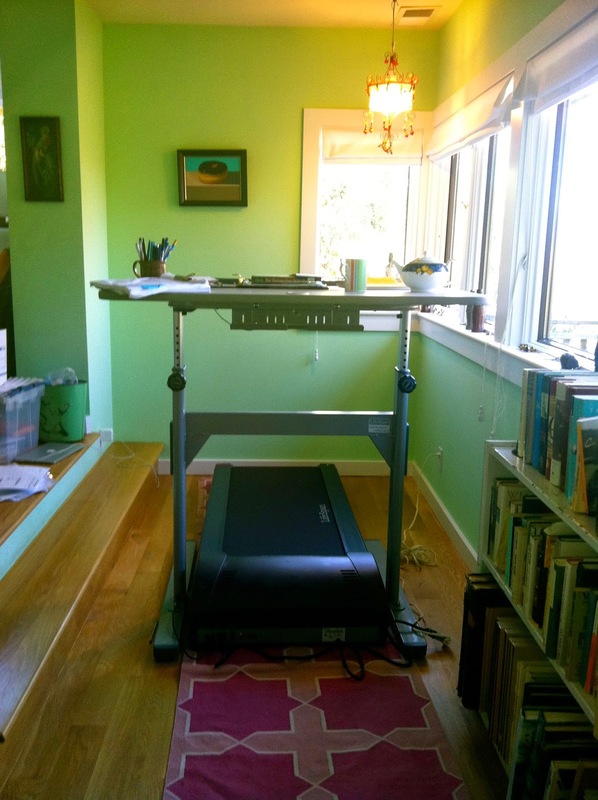 This treadmill desk is great. It's changed everything for me. Reading in a car is problematic for me as well, but I've had no problems with the treadmill. That would really make my day, if a kid said that about my baking. Shoot, I owe you an email. Shortly. Our 22 yr old niece is living with us now and it is nice to have someone in the house who appreciates my cooking/baking and empties the dishwasher. One day I won't have to ask my kids to unload the dishwasher. I hope. Please keep writing. And cooking. The story about Max: so cute! As a frequent cookie-baker, I love to experiment, looking for recipes that tweak a well-known cookie to special deliciousness. (for example, Mrs. Larkin's "chubby, chewey chocolate chip cookies" in Food 52). And, I like to learn new recipes because for me, it's fun. My two-year-old grandson calls me "the cookie grandma". I also remember the quote in one of Rose Levy Berenbaum's books, perhaps the Christmas cookie book,recalling her mother's love of cookies, asking on her visits: "Don't you have a little cookie in the freezer"? Whether I'm baking bread, which I consider an absolutely life-sustaining activity, or cakes and cookies, I believe that baking is a wonderful life skill, one that I truly enjoy. I keep discovering yummy recipes: most recently, the 5-minute artisan brioche dough. I've made 3 batches in the past couple weeks, resulting in "pain au chocolat"(chocolate chip roll), and two batches of unbelievably excellent cinnamon loaves. So easy, so quick, so good! I look forward to your posts, and so enjoy your exquisite writing. Jennifer, don't you realize deep in your bones what an amazing person and amazing writer you are? What a nice comment! Thank you. I love that Rose Levy Beranbaum quote about "a little cookie in the freezer." It's the kind of thing my own mother might have said. Thanks for sharing. How did you tweak Mrs. Larkin's cookies? Maybe one day I'll be "the cookie grandma." That's a lovely thought. Hi! I didn't tweak Mrs. larkin's chocolate chips, actually. Only change is that I prefer using light brown sugar instead of dark . What I meant is that Mrs. Larkin tweaked the basics by adding more flour, with magnificent results (in my opinion). Got it. These are the next cookies I'll bake.